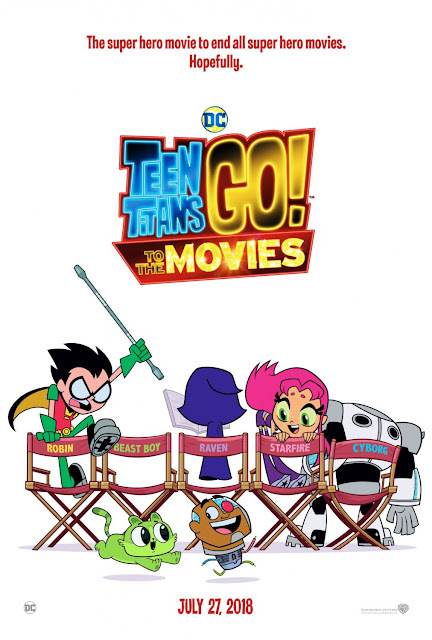 Movie: "Teen Titans Go! to the Movies"
In an era where every superhero is getting their own movie, the Teen Titans want one of their own. The only way they will get one is if they somehow unearth an archnemesis. The Titans believe they have found the perfect enemy in the dubious Slade, who they hope to defeat so they can get their movie deal. If you are trying to make a meta superhero spoof similar to "Deadpool" but aimed more towards kids, "Teen Titans Go! To the Movies" is about as close as you can get. This film is directed by Aaron Horvath and Peter Rida Michail, who both worked as directors on the "Teen Titans Go!" television series from which the project is adapted. Horvath also wrote the screenplay along with Michael Jelenic, who has written numerous animated movies and shows based on DC comics. 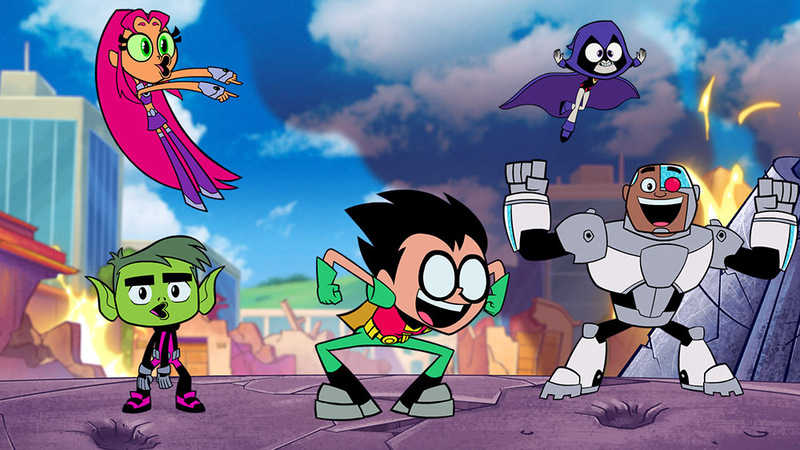 The Teen Titans are made up of Robin (Scott Menville), Raven (Tara Strong), Cyborg (Khary Payton), Starfire (Hynden Walch), and Beast Boy (Greg Cipes). 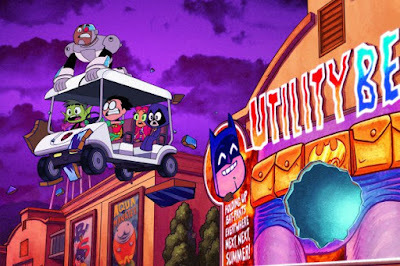 Unlike most superheroes, the Teen Titans seem more interested in having fun, eating burritos, and performing music as opposed to actually fighting crime. Their antics are often so distracting that they forget about the baddie they are supposed to fight, leaving other heroes to clean up their mess. This means they get a lot of disrespect from other heroes, so much so they are even shut out of the premiere of Batman's latest movie sequel. Robin, however, believes the Teen Titans are every bit as worthy of being superheroes as everyone else and that they deserve their own movie, too. All they need is an archnemesis to fight. They believe they may have found that villain in the master mind-manipulator named Slade (Will Arnett). Now, all they have to do is defeat Slade so they can finally get their own movie. We knew absolutely nothing about "Teen Titans Go!" before seeing this movie. We were aware of its existence, but that's about it. We entered this movie screening with no expectations, and we were pleasantly surprised by how humorous, enjoyable, and meta the whole experience was. We laughed consistently, and a lot, throughout the whole thing. This film pokes fun at the entire superhero genre. No one is off-limits. Both DC and Marvel share the brunt of the abused at the hands of Robin and his gang. As we mentioned, this is a very, very meta film. A background shows a poster for the movie "Batman v. Superman: Yawn of Justice." Bruce Wayne's origin story is covered in a clever-but-dark way. Stan Lee makes another infamous cameo. Deep-dig comic book references are a dime a dozen. A lot of the humor in this animated movie is razor sharp, super witty, and definitely targeted towards fans of comic book films that don't take themselves too seriously. That being said, this is still a kids movie, which means there is a fair share of literal toilet humor and a couple of fart jokes as well. Some of these cracks landed for us because after all, like every red-blooded American, we enjoy a well-placed fart gag. Some of them go on a bit too long and don't hit their intended mark. The story is very well done and never feels like it overstays its welcome, which has been an all-too-common problem in TV-to-movie adaptations. "Teen Titans Go! To the Movies" doesn't feel like it is overloaded with filler just to reach a 90-minute runtime. The narrative feels like it is just as long as it needs to be. All of the voiceover work from the original cast is fantastic and fitting. All of the celebrities who have been added just for the movie, like Kristen Bell, Will Arnett, Patton Oswalt, and Jimmy Kimmell, are all great as well. There is one standout, however. NICOLAS-EFFING-CAGE. He finally gets his chance to play Superman in this movie, and that may be worth the price of a movie ticket price alone. Plus, he gets to say the words "explosive diarrhea," which we never knew we needed. You really can't go wrong with "Teen Titans Go! To the Movies." It's vibrant, jokey, sarcastic, and will leave you laughing and singing the catchy songs for days to come. Take a chance on this one.